This is amazing. 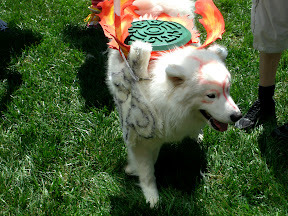 My husband’s family bred show Samoyeds for years so I recognized Dante as one right off (he’s on memebase, btw: http://fandom.memebase.com/2012/07/12/fanart-cosplay-cant-tell-if-best-dog-or-animal-abuse/ … clearly best dog.) I linked this back to his family so they could see this. It’s so cool! I wish my dog (an all-white Husky/Samoyed mix named Zelda) was calm enough to wear things, but she’d probably just chew it up. She does love the harness when it means she gets to go into the car, or run alongside my husband’s bike (WalkyDog Bike Leash-style). 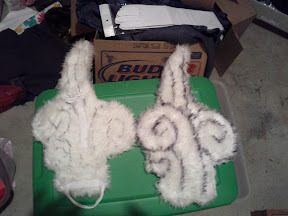 I kind of want to make her a Naga costume from The Legend of Korra, even though her ears are the wrong kind. Heh, awh. In that case, it should definitely possible to get here into a Naga-type harness. I think that would look adorable. You should sell these. I would buy one!